I am standing for Parliament because I believe Queenslanders need an alternative to the blind alley into which either of the major parties, both committed to promoting the interests of wealthy corporations above all else, will lead us. The direction in which we are now headed, under Labor, is towards, social, ecological and economic ruin and a change of Government to the alternative of the Liberal National Party will not change that. The only way that this can change is if for all the Labor and Liberal National Party corporate glove puppets to be removed from office and for them to be replaced with people who are prepared to stand up for their communities against powerful vested interests. All over Queensland the rights of small communities, which are trying to preserve their way of life, their livelihoods and their local environment, are being trampled by the Bligh Labor Government. The plan to dam the Mary Valley, cynically chosen because the Labor Government judged the local community, which overwhelmingly votes Liberal National Party, as politically expendable,1 is only one of the more visible examples. The Labor Party has meted out similar treatment to many other Queensland communities, where local interests have stood in the way of developer profits, mining companies or tollway construction corporations. Indeed, the forced local Government amalgamations of 2007 were enacted by former Premier Beattie and the sitting member for Mount Coot-tha, Andrew Fraser, the then local Government Minister, in response to lobbying by the Property Council of Australia (PCA). Smaller local governments, like the former Noosa Shire Council, were more accountable to local communities than distant larger councils can be, hence smaller local governments posed obstacles to PCA plans. As an elected representative, I would stand up for all local communities. I would move quickly to support the de-amalgamation of councils, where communities so desire2 and I will move to repeal the Community Integrated Planning Act. That act is a bureaucratic nightmare and undemocratically deprived local communities of any veto over development proposals. In addition, much of Queensland's road and transport infrastructure is effectively privatised through Public Private Partnerships (PPPs). No doubt many de-facto privatisations have also occurred under the guise of out-sourcing. One such example was the disastrous out-sourcing of the TAFE's IT services to Unisys by the Borbidge National Party Government in 1997.8 Common land is sold off at every possible opportunity to developers or other private concerns, behind the backs of local communities, or even in the face of their strong objections. The stated reason for the sale of the airports was to raise funds to build hospitals, whilst the stated reason for the sales of Enertex and the stake in Emu Downs wind farm was "to provide for a Climate Change funding stream". Energex and Ergon were sold to raise the necessary funds to build the Traveston Dam. If that dam proceeds, it will destroy the rural community of the Mary Valley and may well cause the extinction of the the Mary River Cod (Maccullochella peelii mariensis ), the Mary River Turtle (Elusor macrurus) and the Queensland Lungfish (Neoceratodus forsteri). Clearly, if it is necessary for our Government to keep on selling off infrastructure in order to build other necessary infrastructure, or to meet recurring expenditure, then the Government and the State Treasurer, Andrew Fraser, are not doing their job properly. Even if it were possible to establish that the ongoing liquidation of Queensland is necessary, the matter should at least be discussed openly with the Queensland public, who are, after all, the rightful owners of these assets. "(I) seek your firm assurance that if you do intend to privatise any of these assets that you state your intention to do so to the public before the forthcoming elections, or, alternatively, that you will put any planned privatisations to the public as referenda." I was particularly concerned that plans might be afoot to privatise our water infrastructure and Queensland Rail. If such plans are in the pipeline, then the Queensland public, who according to all recent public opinion polls, oppose privatisation, have every right to be consulted, if not at the election underway, then in referenda. So far I have received no response from either the Premier or the Treasurer. I will be putting a similar question to Opposition leader, Lawrence Springborg. I will try to ask every other candidate as well in the little time remaining before the election, and I will publish their responses on this web site. That the population increases have been detrimental, not beneficial, to existing Queensland residents should not come as a surprise. Traffic is ever more congested. Trains and buses are so crowded that many passengers have found themselves left at bus stops and stations during peak hours. Queensland residents are being made to pay ever increasing charges to build new water, electricity and transport infrastructure to cope with the influx of people. Public hospital waiting lists have blown out to the point where many just don't bother. Instead, people, having no alternative, take on board the enormous costs of treatment by private hospitals. Premier Anna Bligh, for her part has been most disingenuous, as both she and her predecessor Peter Beattie, have actively sought to bring about the population growth that Bligh now chooses to blame for the problems her Government faces. Both of them have played the Queensland public for fools over the question of population growth. 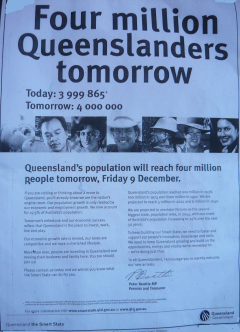 On 8 December 2008, in anticipation of the birth of 4 millionth Queenslander, the Beattie government placed the pictured full page advertisement in the then broadsheet Courier Mail newspaper. The purpose of this advertisement was to present Queensland's population growth up to that point as inherently good and to promote more of the same. "If you are visiting or thinking of a move to Queensland, you'll already know we are the nation's engine room. Our population growth is only rivalled by our economic and employment growth. We now account for 19.5% of Australia's population. "Tomorrow's milestone and our economic success reflect that Queensland is the place to invest, work and play. "Our economic growth rate is envied, our taxes are competitive and we have a cherished lifestyle. "Please contact us today and we will let you know what the Smart state can do for you. "Queensland's population reached 1 million in 1938, 2 million in 1974 and three million in 1992. We are projected to reach 5 million in 2022 and 6 million in 2040. "We are projected to overtake Victoria as the second biggest state population wise, in 2044, with our share of of Australia's population increasing to 24% over the next 50 years. "To keep building our Smart State, we need to foster and support our people's innovation, knowledge and skills. We need to keep Queensland growing and build on the opportunities, energy, vitality we're renowned for - we're doing just that. "To all Queenslanders, I encourage you to warmly welcome our new arrivals." The advertisement was signed "Peter Beattie MP Premier and Treasurer". At the foot of the page were the words, "Queensland the Smart State." What Beattie neglected to mention was that the new arrivals would increase demand for scarce housing, which had already driven so many existing Queenslanders out of the housing market, or even the rental market. What he also neglected to mention was that the prospective newcomers' additional demand for water would be used by him as an excuse to try and destroy the Mary Valley rural community and threaten with extinction various endangered species there. The following year, at a public forum on water, I asked Premier Peter Beattie to acknowledge that the water crisis had been made worse by population growth. I asked him if he was prepared on that basis to come out and state clearly that further population growth was not in the interests of Queensland and, moreover, if he would therefore desist from encouraging more population growth? The Queensland Government, as we all know, has continued to aggressively promote population growth. It is truly difficult to understand why any political leader would seek to so deliberately harm the overall wellbeing of the society they have pledged, as elected parliamentary representatives, to look after, but that is what they have done. The reason, as explained in another article "How the Growth Lobby threatens Australia's future", is that the Government's policies serve the interests of a small powerful minority which profits from population growth whilst the rest of the community pays with a declining standard of living, quality of life and democratic input. Throughout 2008, rental increases got further out of control. By early 2009 even well-paid professionals were having difficulty meeting rental rises caused by the demands of apparently insatiably greedy landlords. Starting in early 2008, an established retail community in Latrobe Street Paddington was driven out by continuously increasing rents. In March 2009, unable to afford rent, which had doubled in the two and a half years since she opened her business, Joan Winter was forced to close the Baboa Gallery. Instead of applying token band-aid measures, the Queensland Government must urgently take decisive action to help those it has left so much in the lurch in recent years. First and foremost, it must immediately desist with its encouragement of population growth. If anything is to be learnt from recent years, it is that we cannot rely on the inequitable and grossly inefficient private sector, if we are to ever achieve affordable quality housing for all Queenslanders. to meet our housing needs, we must re-establish the Queensland Housing Commission as a provider of quality affordable housing as it was when I grew up in Brisbane in the 1960's and 1970's. Whilst such a policy may cost us in the short term, in the longer term it should prove vastly cheaper than the current out-of-control private housing market. Where people choose to own their own dwelling and not rent from the Housing Commission, state taxes must heavily discriminate in favour of them and against those who already own their own dwellings. The eventual goal of this policy would be to ensure that no-one owns more than home whilst others are deprived of owning any. In the meantime action must be taken to protect private tenants from unreasonable landlords. Tribunals with special powers to protect tenants and to reverse the excessive rent rises that have been imposed upon many renters in recent years need to be set up. Certainly, where no demonstrable economic hardship will be caused to landlords, rents should be immediately reduced back to the levels of 2005. When, nearly seven decades ago, our society was threatened with invasion by Japan our country pulled together as one in order to defeat that threat. It has been calculated that we devoted 30% of our economic output towards that war. Today, in stark contrast, whenever a suggestion is made that some sacrifices are necessary to defeat the far greater threat of global warming, that suggestion is dismissed, if not denounced hysterically. In March 2007, Rupert Murdoch's Courier Mail pilloried Greens leader Bob Brown as wanting to destroy Queenslanders' jobs for proposing that our coal export industry be scaled back over time. Thus began and ended any debate on this question in the mainstream Queensland newsmedia. Much of Queensland's own agricultural farmland and native flora and fauna face despoliation at the hands of the mining industry. Examples include the 8000 hectare Bimblebox nature reserve in central-west Queensland, which lies over a massive planned open cut coal mine, the Felton Valley, described as South East Queensland's salad bowl, just south west of Toowoomba and, outside of Queensland, Caroona on the Liverpool plains of News South Wales. If elected, I will act to reduce our coal extraction industry, regardless of whether or not the current recession ends soon. We must decrease our dependence upon the income derived from coal. Also, we must use whatever influence we have with the Chinese Government to encourage it to reduce the dependence of its upon such massive imports from Australian coal and other raw materials. This means that Queensland will have to face a future in which we can no longer depend upon royalties from mining exports to balance our state budgets and a good many mining jobs will no longer be there. Alternative, less environmentally destructive jobs for displaced miners will have to be found, but no-one should be under any illusion that these jobs can be as lucrative as many mining jobs have been. Instead, a good many more of us are going to have to find ways to create wealth, by growing it, by harvesting it from the seas, or by making it with our own hands, as our forefathers and foremothers before us have. This is the price all of us, and, most of all, those who have gained the most from the ransacking of our global ecology up to now, must be prepared to pay, if children are to have a decent future, or, indeed, any future at all. If that concept is difficult for today's political and industrial leaders to grasp, I am sure it would not have been so difficult for our forefathers, fighting in the jungles of New Guinea. Realistically, I know I stand almost no chance of unseating the sitting member, Andrew Fraser, in this election. This is not because I don't believe that I would be less capable of representing the electors, but because I cannot hope to be able to reach a sufficient number or Mount Coot-tha residents in the limited time available with my very limited resources. Nevertheless, this should not mean that your vote for me need be a wasted vote. Your vote for me will help to let the major party candidates know, even if choose to direct your preference toward one or the other, that you are dissatisfied with the way they have represented your interests in Parliament. They will then know that they can only continue to do the same at their peril. I urge you to also make full use of the optional preferential voting system. Be wary of any candidates who tell you to 'just vote one'. A choice between a poor candidate on the one hand and an even worse candidate on the other can still be a very important choice. For my part I won't hold back from letting you know how I think you should order your preferences, but that is a choice that you must ultimately decide for yourself. Many of the policies I stand for were Labor Party policies: opposition to privatisation, more public sector spending, support for collective bargaining rights for workers, etc. I believe that your best chance of having Labor again promote the good policies that it once stood for is for you to give your primary vote to me. Given the appalling misgovernment of both the major parties that I have witnessed at the statewide and local level, in the four and a half years since I moved back to Brisbane, the Greens should have had little difficulty increasing their electoral support, yet in all this time the Greens have essentially stood still and the 2009 elections promise to be little different. The Greens have recently attracted sitting Labor member, Ronan Lee to their ranks. However his re-election on the basis of his primary vote alone is not assured. If preferences from those Labor voters who follow the advice of the official Labor Party "how to vote" cards prove necessary to secure Ronan Lee's re-election, then how independent from the Labor Party can he truly be expected to be? Will a price have to be paid by the Queensland Greens? Or has the price been paid, in part, already? The Greens' literature, in particular the brochure (pictured) for Mount Coot-tha Greens candidate Larissa Waters distributed last weekend confirms some of my concerns about the Greens. Some parts of the brochure do show promise. It rightly promises to end the property resumptions for the building of the Hale Street Bridge and Northern Link tunnel white elephants and it decries the "rampant urban growth, poor public transport, and crowded public transport". Taken overall, the brochure disappoints, however, especially given the potential use that could have been made of its massive folded double-sided A2 size. Reading this brochure, one could be forgiven for not realising the scale of the world's ecological crisis, to which Queensland's own state Labor Government has contributed more than its fair share. No specific mention of Queensland's greatest ecological crime, that is, its record level of climate-changing coal exports, is to be found. Little is to be found about many of the issues I have raised in this document: the outrage of the anti-democratic forced local government amalgamations enacted by Mount Coot-tha's sitting member who was Minister for local government at the time, and the almost innumerable other instances of the Queensland government trampling upon the rights of local communities. Nothing is said of the scandalous ongoing sell-off of public assets. Whilst a small part of the brochure rightly argues for the protection of some of Queensland's natural wilderness areas, it gives the reader only the barest clue of the terrible scale of environmental vandalism being inflicted upon this state by the Bligh Government. Above all, the brochure neglects to specifically mention the population growth encouraged by the Queensland Government, as mentioned above. This population growth is the principle driver of the "rampant urban growth" of which it rightly complains. The brochure further neglects to point out that population growth, in combination with an almost complete lack of any worthwhile town planning or effective decentralisation on the part of the Queensland government, has made necessary massive expenditure on transport infrastructure, whether it be the most inappropriate public roads, tollway roads, toll bridges or toll tunnels or the more appropriate public transport. Instead of raising the alarm about the environmental calamity that threatens us all, and expressing the sense of outrage that many of us feel at Anna Bligh's gross misgovernment of this state, the brochure appears to convey an impression that all will be fixed, even as Queensland's population continues to climb, by the spending of a bit more money on public transport, rainwater tanks, free solar panels to pensioners, and the creation of 7,600 'green collar' jobs entailed in the construction of two new Solar Power stations. In reality, even the full achievement of all of the Greens' campaign promises would only be scratching the surface of the serious problems we face. Indeed one Green policy, mentioned on the brochure, that is, its support for water recycling -- rightly rejected by the Toowoomba community at a referendum in 2006 -- would only make matters worse. I was a member of the Greens party back in 2003. I joined it, whilst working in Canberra, hoping to help stop the threatened invasion of Iraq. I have a great deal of admiration and respect for many of the Greens Parliamentary representatives, as well as many rank and file Greens. 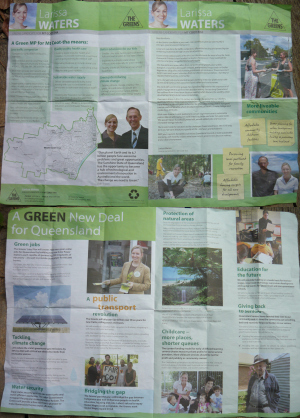 Nevertheless, the Greens campaign literature, as discussed above, further confirms my impression the Queensland Greens, overall, lack the vision necessary to make their organisation a truly effective force for good in Queensland politics. If you are a Greens supporter, but agree with my concerns about the Greens, then I believe your best chance to make the Greens lift their game is to give your primary vote to me or to other independent candidates who stand for similar policies and then to give your second preference to the Greens. (In fact, that is how I intend to vote myself.) Of course, I also urge you to take full advantage of the preferential voting system and to consider careful whether any worthwhile differences between the two major parties exist and, if so, order your preferences accordingly. Throughout my voting life my own preference has been against the major conservative political parties. Whilst that hasn't changed fundamentally in 2009, I, nevertheless, find myself in strong agreement with a number of the policies of the Liberal National Party against those of the ruling Labor Party. These include its policy to offer Queensland communities which so desire an opportunity to de-amalgamate their local governments, its opposition to the Traveston Dam, and its opposition to coal mining in the Felton Valley. I understand why many in Queensland, appalled by the incompetence and the autocratic governing style of the ruling Labor party, would see its replacement by a Liberal National Party Government as a solution to Queensland's ills. However, it is apparent to me that on on many critical issues the Liberal National Party (LNP) is no different to the Labor Party and on some questions it is worse. The LNP, together with the Labor Government has supported the population growth which, as raised above, has caused much of Queensland's serious social, environmental, economic and fiscal problems. Both have supported the ongoing fire-sales of publicly owned assets and both appear to be committed primarily to the private motor vehicle as the answer to our transport needs. Above all, both are recipients of massive donations from private corporations, especially property developers. For these reasons, in the longer term, a Liberal National state government cannot be expected, any more than the Labor Government, to put the interests of ordinary Queenslanders above the needs of their corporate benefactors. Of course, the Queensland Labor Party's own record and the appalling record of the neighbouring NSW Labor Government on privatisation offers no guarantee against further privatisations. By attempting to privatise NSW's electricity generators, the NSW Labor Government went against the wishes of at least 79% of the NSW public and against an overwhelming vote against privatisation at the state Labor Party conference in May 2008 and against commitments not to privatise made prior to the 2007 elections. "What he said is he's confirmed every permanent public servant won't get sacked as a result of the change of Government, but every time someone retires or resigns they won't be replaced so that means there'll be a cut of 12,000 jobs next year. Whilst on some environmental questions the Liberal National Party is better than Labor on others they are worse. An example of the latter is the Opposition's support for the environmentally atrocious shale oil project, which the Bligh Government blocked after facing a massive community protest campaign. Another is its support for Uranium mining, which the Labor Government still rightly opposes. So the election of a Liberal National Party Government may still actually make matters worse, and not better in the longer term. Nevertheless, if you are resolved to vote for the LNP, but want something better of an LNP government than we are likely to get based upon past experience, please still consider giving your primary vote to me. Above all, inform yourself and others about the issues I have raised in this article and discuss them with. If you would like to help me in any way in this campaign, for example by handing out leaflets on the streets or by giving a few to friends please get in touch, through our contact form or by phoning 0412 319669. Please visit our website, make comments, or, if you have a story, which you believe may be of interest to other electors, contribute an article. Make links back to our site from your own web site, if you have one, on public forums or in e-mails. 2. ↑ On this one issue, at least, I am almost in complete agreement with Opposition leader Lawrence Springborg. See also "Springborg's de-amalgamation plan" in the Government News of 4 Sep 08. 3. ↑ Tabling of Air Assets (Restructuring and Disposal) Bill on 26 August 2008 at www.parliament.qld.gov.au/view/legislativeassembly/tableOffice/documents/HALnks/080826/AirportAssets.pdf. 7. ↑ The SGIO had been partially privatised by the Borbidge Liberal and National Party coalition government. During the 1998 election campaign, Labor Opposition leader Peter Beattie, promised to retain half government-ownership of the SGIO, but broke that promise upon winning government. 8. ↑ This personally affected me. From 1996 until 1998, worked for the Warwick TAFE college to build a community Internet Service Provider, Flexi Net. After the TAFE IT services were outsourced to Unisys, a sham inquiry was conducted into Flexi Net by a Unisys consultant. Submissions from the local community overwhelmingly in support of TAFE's ISP were ignored and a recommendation to sell the ISP to a local consortium, the Warwick Business Association, was made. I worked for the new consortium. In August 1998, barely three months after he succeeded in transferring the ISP to its new physical location in the Warwick Town Hall, I was sacked, without receiving a written reference, by Peter Darton, the appointed technical manager of the ISP and Garry Hansford the business manager. 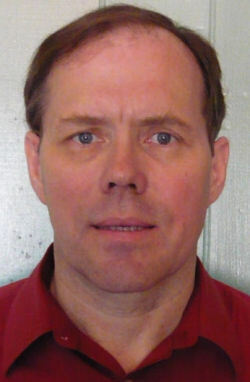 Peter Darton now owns Warwick Computer Service. In 2001, a previous employee worked of the Southern Queensland Institute of TAFE (SQIT), advised me that people high in the management of SQIT, which encompassed the Warwick TAFE college, wanted to expand Flexi Net to other Southern Queensland TAFE colleges. The source said that this plan was initially defeated by politics within SQIT and never saw the light because of Unisys. If Flexi Net had expanded, SQIT, with its large existing internal computer network, could well have been the ISP for rural southern Queensland. Instead, Flexi Net has long since been on-sold to Ipswich City Council's HaleNet, which was bought out by a Victorian ISP. 9. ↑ See quarterly summaries as pdf documents on "Australian Demographic Statistics" page on Qld Government web site at www.oesr.qld.gov.au/queensland-by-theme/demography/briefs/aust-demographic-stats/index.shtml and Australian Historical Population Statistics, 2008 and "Australian Historical Population Statistics" downloadable for the Australian Bureau of Statistics. 10. ↑ "Private fix for surgery" (unable to find URL) in the Courier Mail of 4 Mar 09. The words in this report were, "Ms. Bligh dismissed suggestions the move was a concession the current public system could not cope, saying demand had had surged because of population growth". The story reported Anna Bligh's election promise for the state Government to use private hospitals to provide 20,000 hospital patients with elective surgery over the next three years. 11. ↑Qld govt rejects population cap in the Age of 22 April 07. Also cited in "How to end the Queensland economy's addiction to population growth?" of 26 Apr 09. 14. ↑ "Lawrence Springborg announces $1bn in expenditure cuts" in the Australian of 3 Mar 09. 15. ↑ "Springborg to unveil election pledge funding" on the ABC news of 3 Mar 09. I found your website after doing some research into my choices for the upcoming election (shock and horror, there are still some of us out here who actually put some thought into choosing our representatives rather than simply buying whatever ad campaign pushes the right buttons). I'm heartened to find that there's someone out here who's actually putting forward some actual rationales behind their platform, instead of towing a party line that seems to exist for historical or populist reasons. I, too, am quite fed up with party politics and the lack of representation it actually means for the average punter. I back you wholeheartedly on privatization and housing affordability (even though I am a home-owner!). Any sale of government assets takes those assets out of the ownership of the whole community and turns them over to the portion of the community that can afford to buy it. On the other hand, I vehemently oppose your stance on coal - the developing economies of the world aren't going to shut down their existing coal-fuelled infrastructure simply because Queensland isn't selling. Queensland is the world leader in clean-coal technology, and while I acknowledge it's not there yet, we're the people to deliver it to the world. But at least I know you're going to put some thought into the issues, which is more than I can expect from the Greens (who I fear try too hard to appease the hippie left who often oppose good policy out of a luddite-like fear of technology), Labor (who get into power on the backs of 'the little guys' and then rort the system for all its worth, time and time again) or the LNP (who are descendants of Joh, and it shows).